It appears that Motorola was not the only company that’s offering the ability to customize a phone, such as the Moto X. Long before the Motomaker, HTC and Sprint were working on a project called HTC Design Customization. 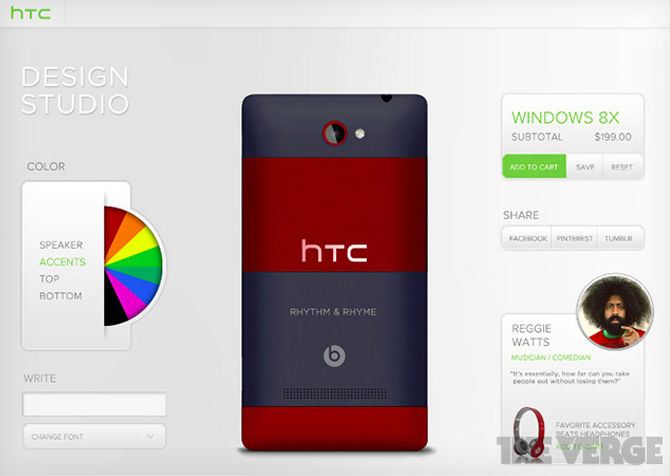 As shown in the image above, it involved a color customization and various other tweaks brought to a phone like the HTC 8X and 8S. The HTC 8XT was also involved and allowed customers to customize a range of colors on the handset. HTC Design Studio was behind it, also planning a web app for that, that included an ordering mechanism for Sprint customers. You could tweak the color options for the speaker, accents, the two tone highlights and even personal engraving was an option. Sprint and HTC both canceled the project, because of the high costs. However this makes me wonder: is Apple going to do the same with the iPhone 5C budget handset and its colorful cases?